So as the semester is coming to an end, we had our last week of activities to be done. 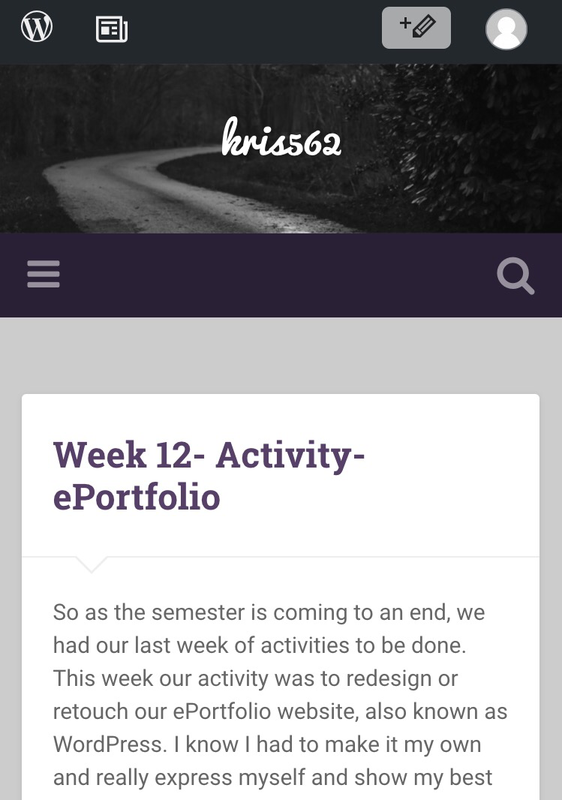 This week our activity was to redesign or retouch our ePortfolio website, also known as WordPress. I know I had to make it my own and really express myself and show my best self here as it can be a great too for future jobs or social networking. I decided have my background be a purple setting, with a picture of a road as my header. I want my page to get the audience/ reader to feel serene and calmness when looking over it. It was fun to look at all the tools and explore what I can change to make my blog an expression of who I am as a person and to show that off to people all over the world. Having a WordPress and blogging for the first time opened up my mind to be creative and gave me a purpose and voice to show that I have things to say and I would like others to know what is on my mind.